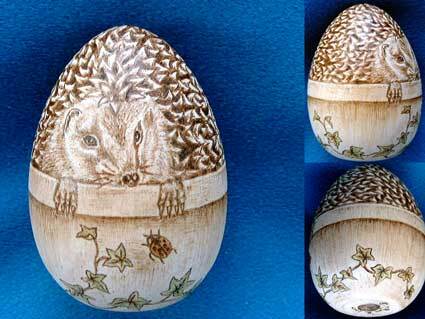 The design on this birch egg (approx 2.5" x 1.75" in size) is a variation on the theme of the original Hedgehog in Flowerpot depicted in the Portfolio: "Eggceptional" gallery. A thumbnail sketch of the proposed layout was first prepared. In this version the face of the hedgehog is turned to one side gazing down at a ladybird crawling up the side of the flowerpot. 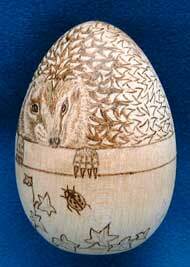 The design was then lightly sketched directly on to the egg with a soft 2B pencil. The ladybird and ivy detail around the flowerpot replace the snails and grass featured in the original. 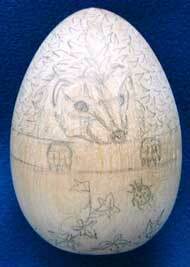 Using the pencil lines as a guide, the outline of the design was first burned in with the pyrography pen. 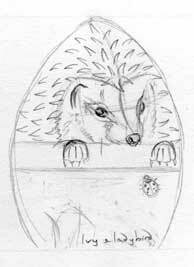 Commencing with the face and paws of the hedgehog, detail was developed gradually. Short, fast strokes were used to suggest the soft fur of the face, while slow, steady ones were needed for the darker area between the spines. Tonal shading was then added to each individual spine and the depth of the burn deepened in the darker inbetween area. Once pyrographic shading was complete on the flowerpot and ivy, the final touch was a subtle hint of colour to the ivy leaves and ladybird with artist quality coloured pencils. 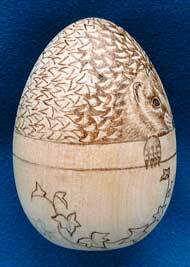 On completion the egg was sealed with three coats of a non-yellowing satin varnish.